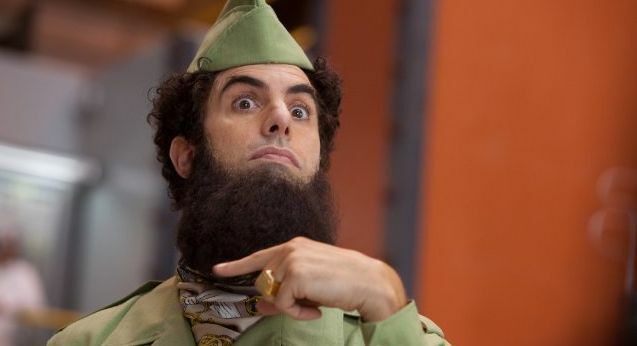 The Dictator, a rude, ribald comedic gift to the Zionist West, is a bit of a cinematic departure for Sacha Baron Cohen. The wildly successful and beloved Borat and its follow up, the less successful and less loved Bruno were both loosely scripted ambush comedies featuring Baron Cohen immersed in method character playing bumbling foreigners confronting both common and celebrity Americans, awkwardly but hilariously revealing prejudices about race, religion, and political correctness. The Dictator is strictly a scripted comedy, though no less fearless, shameless, and incredibly funny, with Baron Cohen once more playing a bumbling foreigner gleefully riffing on Western bias towards the Middle East as well as poking fun at every race, creed, and cultural ideal under the sun. Baron Cohen goes back to the well with a different bucket and finds it overflowing once again. The titular Dictator Baron Cohen plays is Admiral-General Aladeen, idiot supreme ruler of the oil-rich North African nation of Wadiya and the last of the great dictators -- his peers like Kim Jong Il, Saddam Hussein, and Gaddafi are no longer with us. On a visit to the United Nations, Aladeen finds himself unwittingly embroiled in a plot to replace him as dictator and have him executed the way he executed hundreds of people who displeased him in some way or another, like maybe, possibly questioning his intelligence. Aladeen finds himself lost in New York City, but befriends a crunchy organic grocer played by Anna Faris, a relationship that strains belief as if one were tugging on Aladeen's Beard of Doom. Somehow Aladeen must reclaim his position as supreme ruler of Wadiya and maybe learn a little something about democracy along the way. To say more would ruin the multitude of gut-busting gags, though it all leads to a monologue by Baron Cohen about how Americans couldn't possibly understand what it would be like to live under a dictatorship that is a scathing and devastating indictment of our current cultural and political landscape. The Dictator falls in between Borat and Bruno, but upticking towards the crowd-pleasing qualities of Borat. It's a very Aladeen comedy. The Dictator is so Aladeen, it redefines the word Aladeen. Though parts of it may be too Aladeen for some. Having a definition of the word planet that expresses what we think a planet ought to be, is concordant with this desire to bring order out of chaos and understand the universe. New definition also attempts to tackle many of the more sticky aspects of the definition adopted by the IAU. Exoplanets). Pogba scored twiceGet Manchester United FC updates directly to your inboxSubscribeSee our privacy noticeMore newslettersIn a big sister little sister shirts game where Manchester United were poised to be judged on how they would win, rather than if, the manner of their opening goal was an ode to their caretaker coach's greatest moment.An inswinging corner, a near post header and a far post finish. It did not have the perfection of Beckham into Sheringham and Solskjaer (has won it). Nevertheless, Nemanja Matic's tap in from Victor Lindelof's blocked connection delighted Ole Gunnar Solskjaer, who hugged Michael Carrick and Kieran beard shirt McKenna and hurtled down the black lives matter t shirt steps to embrace Mick Phelan.